The Board of Higher Education has announced its selection of Dr. Rosevonne Makaiwi Pato (center) as the new President of ASCC. Dr. Pato is seen here with her colleague Dr. Mikaele Etuale (right), ASCC Vice President of Administration and Finance, and Monsignor Viane Etuale of the Board of Higher Education. On Friday, December 2, Board of Higher Education Chairman Rev. 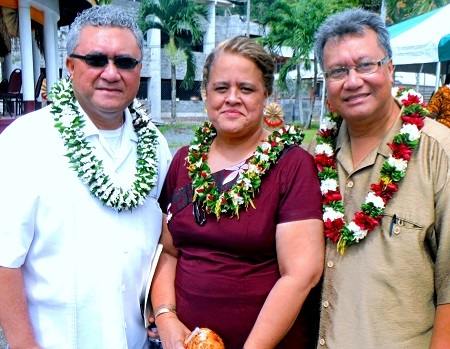 Dr. Leanavaotaua Sekuini Seva'aetasi addressed an internal memo to the administration, faculty staff of the American Samoa Community College (ASCC) to inform them that Dr. Rosevonne Makaiwi Pato has been chosen by the Board as the College’s new President. Over the course of 15 years with ASCC, Dr. Makaiwi-Pato has been an Academic Counselor in the Student Services Department, an instructor for both the Health and Human Services Program and the Teacher Education/ American Samoa Bachelor’s in Education Program, as well as an adjunct instructor for the Social Sciences Department. She has served as Director of the Office of Institutional Effectiveness and Vice President of Administrative Services before assuming her most recent position of Vice President of Academic and Student Affairs. Dr. Pato holds a Bachelor of Arts degree from the College of Liberal Arts, University of San Francisco; a Master of Education degree with an emphasis on Counseling and Guidance from the University of Hawaii at Manoa; and a Doctor of Education degree in Counseling Psychology from Argosy University in Phoenix, Arizona.